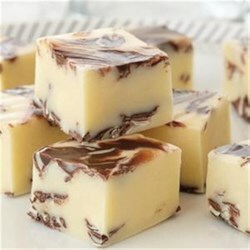 "Chunks of minty chocolate are sprinkled liberally throughout this easy white fudge." Line 8 x 8-inch baking pan with foil, extending foil over edges of pan. Sprinkle 1/3 cup thin mints evenly in prepared pan. Combine sweetened condensed milk, white baking chips, butter and salt in medium microwave-safe bowl. Microwave on HIGH 2 minutes or until melted and smooth when stirred. Spoon half of fudge mixture into prepared pan. Sprinkle with 1/3 cup thin mints. Top with remaining fudge mixture. Sprinkle evenly with remaining thin mints. Swirl with tip of knife to blend colors. Chill 1 hour or until set. Remove fudge from pan by lifting edges of foil. Remove foil. Cut into small squares.